Hi Terri. 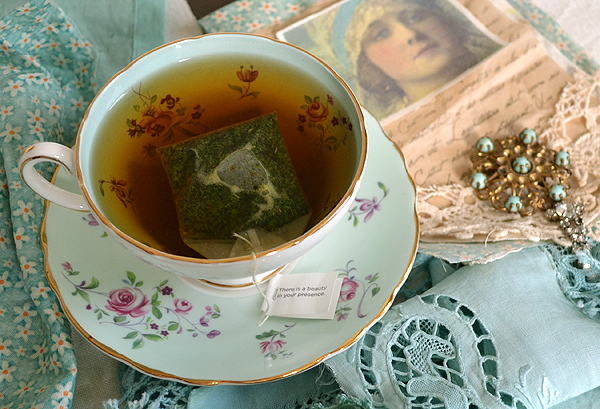 What pretty teacups and what a special gift! 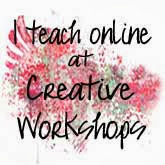 You must have had such fun creating! Love the pretty blue your things turned out. Gorgeous! Happy 4th of July! I'm sure you'll make something very nice with all these laces in soft blue! How romantic and feminine. Thanks for the tutorial. Happy Tuesday. 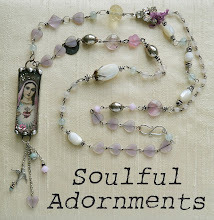 I am off to work..
What gorgeous treasures from sweet Suzy! Her work is just lovely! 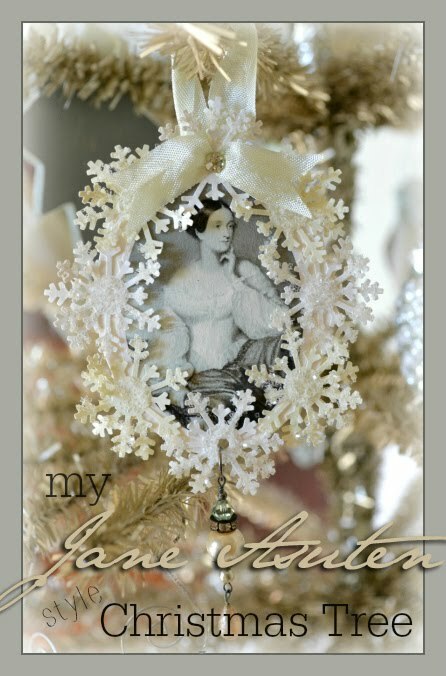 Your project with the lace/fabrics is amazing! such a gorgeous color. I can't wait to see it all. Your aqua post looks so pretty with your blog. 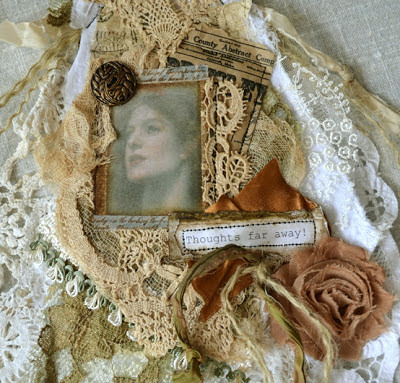 Love your altered art gift and the note paper with the butterfly. 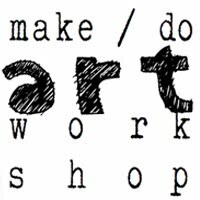 I have another blog that I'm working on for all of my fiber art projects. Thank you for hosting a lovely tea. Wow..I am soooo in love with the aqua dyed linens..they came out so beautifully Terri...totally fabulous ad charming..one of my fave color palettes...stunning!How exciting a transformation! 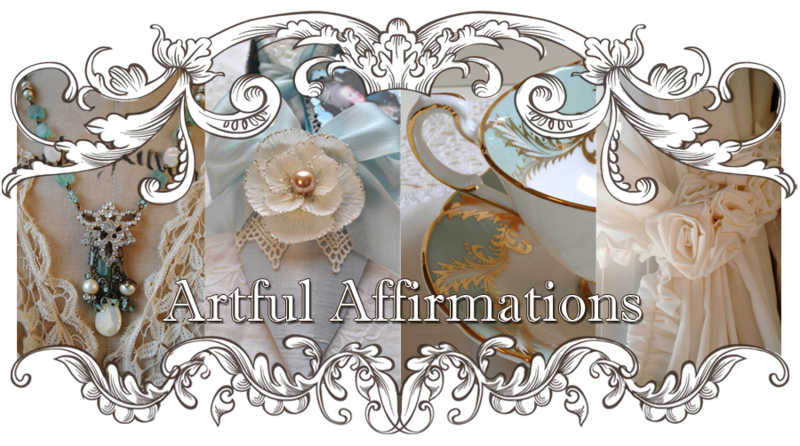 Beautiful tea cup..and gorgeous pictures..and love all of the treasures you have shared! and again..I so enjoyed your Garden Tea party..so fun..and it was great to play! Wishing you a beautiful summery day! Your aqua post looks so pretty with your blog and I love your altered art gift with the pretty music paper and butterfly. I have another blog that I'm working on for all of my fiber art projects. Some day I hope to make a fabric book. Thank you for hosting a lovely tea. Terri - this is just what I needed to see this morning to get myself in gear! 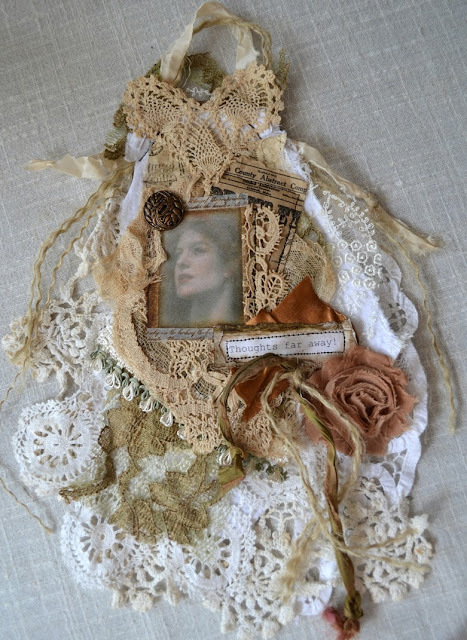 I LOVE this sort of collage work - all my favorite things serendipitously tossed together that is simply transporting! I have my own small collection - piles here and there - and am working on re-organizing all my stuff to return to my own art - and open on Etsy - which is awaiting a basement re-fit. I have been dragging my feet in that direction - it is a daunting task. But your images today have lit a fire under me - I can't get to THAT place until I purge and re-purpose space. Basement today - with tea (sweet cup, BTW) and since we're under cloud cover and rain - not missing much outside. 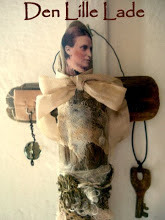 Blessings to you - always an inspiration! What a pretty teacup and oh my, those aqua laces are scrumptious! Be still my heart! I do adore that colour! Suzyq is a thoughtful friend. You will have so much fun creating with all those laces and ribbons. Thanks for sharing today and Happy 4th of July, my friend! Your teacup is gorgeous, too. It too is rainy today - so no tea outdoors - well at least photographing them, I DO tend to run into my little "Zen Room" for teatime to get some fresh air if it isn't too hot or TOO hard raining. une très belle tasse avec ses roses! je viens de tester la teinture sur des chemises en lin! la machine tourne : je suis impatiente de voir le résultat! 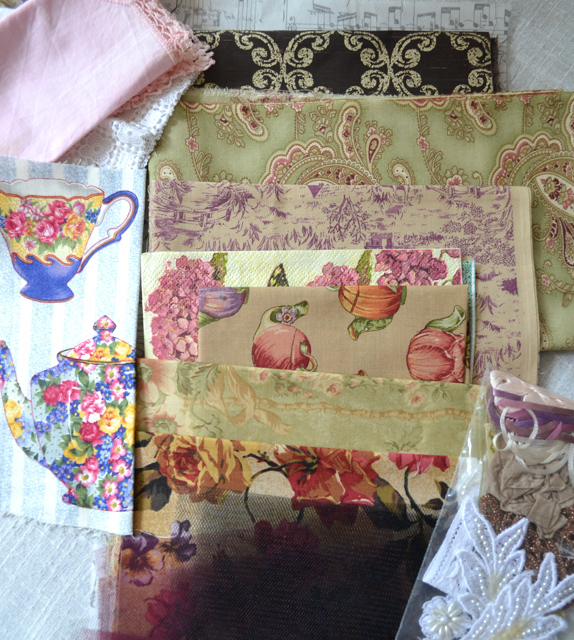 The fabric collage is so pretty. And, so are your blue linens and lace. I love that color of blue. So pretty! Those dyed pieces of lace and cloth are beautiful. I can't wait to see what you create with them. what a gorgeous idea to dye all these fabrics. They tuned out beautiful with a soft turquoise, which I love very much. I know thats your favored color. 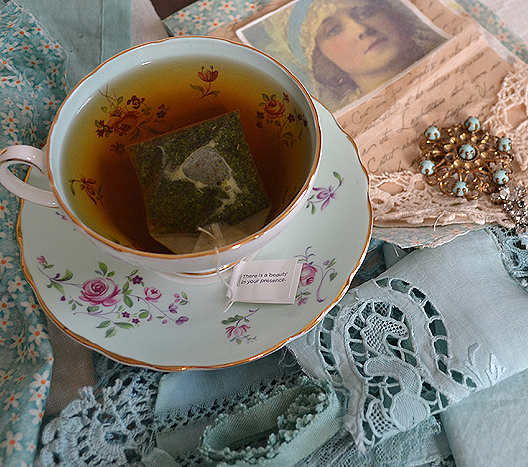 The picture with the tea cup and the aqua lace is so pretty. You will make wonderful things with the lace. Thank you for sharing this great idea and for hosting this sweet event. 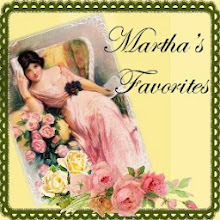 I love your ideas on vintage linens. 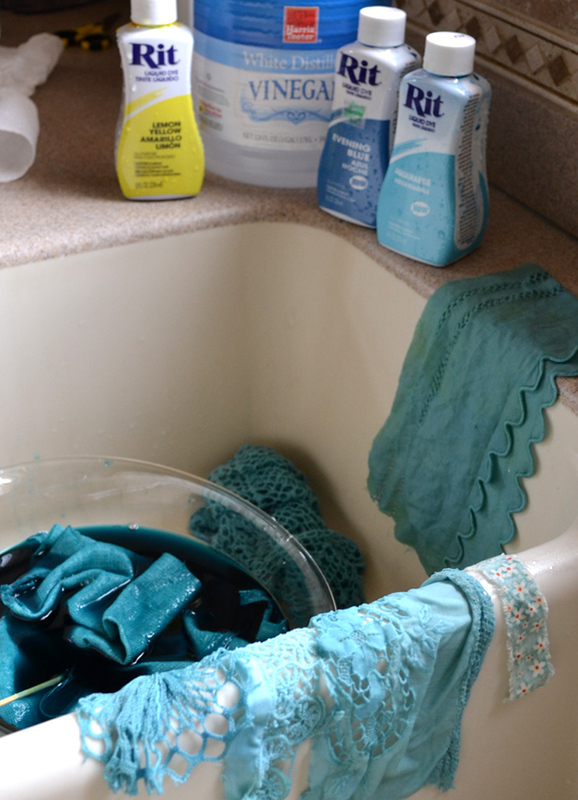 The aqua dye really changed the linens into different hues. Your tea really sustaned you! VERY CREATIVE! Thank you for hosting. Your teacup is a lovely pattern. I think that I have something similar. You did an amazing job dying your doilies. They are an absolutely gorgeous colour! Thanks so much for sharing! I agree-Suzy's fabric projects are breathtaking! What a beautiful pkg of goodness you have received! Your dyed fabrics and bits look so gorgeous. Can't wait to see what you do with them Terri. what a beautiful gift you recieved from sweet Suzy!! 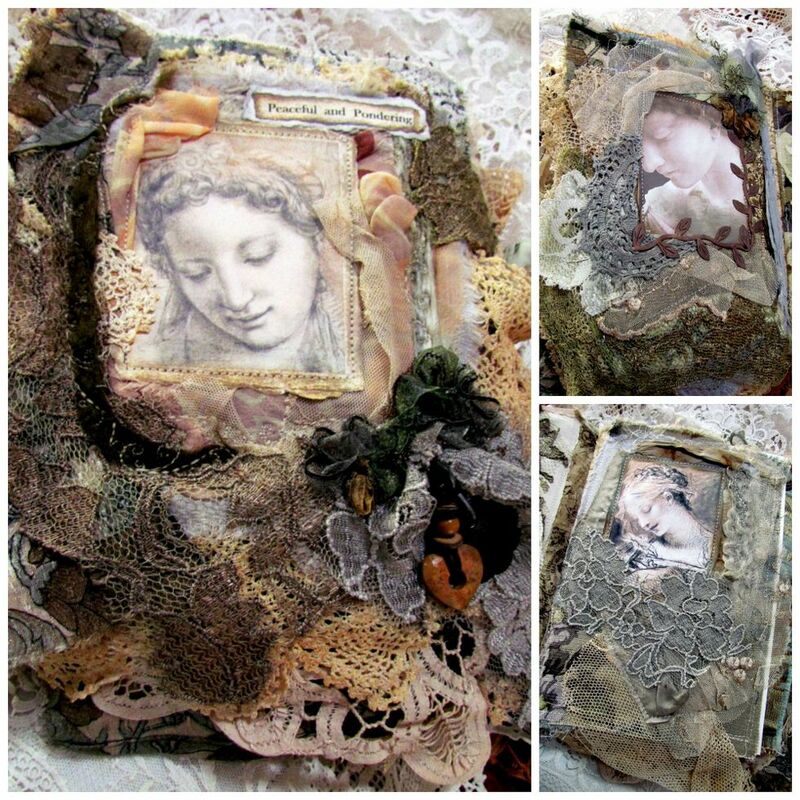 Suzy is one of my dearest friends, and a gorgeous artist in making her most amazing journals and collages, and whatever else she puts her hand on.....just like you!!! The dyes you made are all so gorgeous, what lovely colour tones, they are my favorites too, Terri- I love to use the great turquise stamppad you gifted me !!! Now I can`t wait to see what you are going to create with those materials. I have also today dyed some pieces, but with plant colour ,made from plants in the field outside my dor- so fun to see how it turns out!! Beautiful lace from Suzy! Can't wait to see what you will do with these beauties. Have a wonderful Fourth weekend ahead. Thanks for the party. This is so lovely! We're having a gully washer right now - for the next few days - I am looking for indoor projects! My mind is already wandering with the thoughts of all the blues and greens and fabrics and laces! I am so excited at seeing your post, and so happy that Suzy inspired you so! Her gifts are divine, and I cannot wait to see what you create, it sure is starting out lovely! 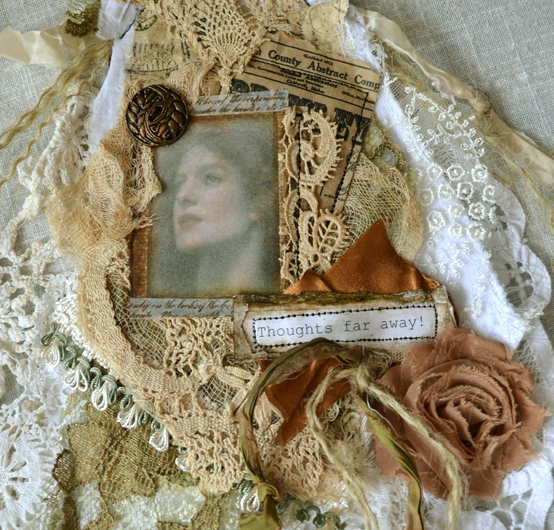 Suzy's work is amazing, and how sweet of her to send you something so lovely! Your aqua fabrics are making me happy, and I can hardly wait to see what you create with them. Terri this is is such a gorgeous post! I love everything in it. Those blues and greens are just SO pretty! Hello Terri~ What a nice surprise from your friend! Looks like she inspired you and you had lots of fun despite the rain. Your teacup is sweet. Have a wonderful week! I have grown an appreciation for hues of aqua myself lately and the first step was a can of turquoise spray paint. I like the colours of the teacup and the way the lace and linens turned out. 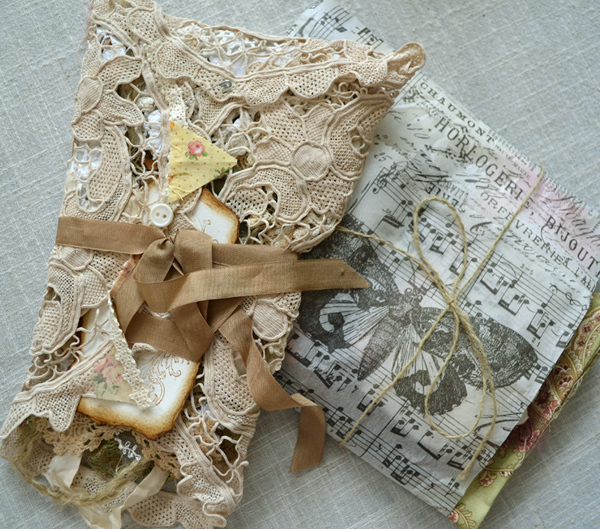 A number of bloggers are covering books and boxes with lace bits and they sure look pretty. If anyone can part the clouds on a gloomy day it's you, Terri! What a beautiful gift from Suzi, and your muse lead you to create some yummy pieces. The color is so "you" and I'll be anxious to see what you create! 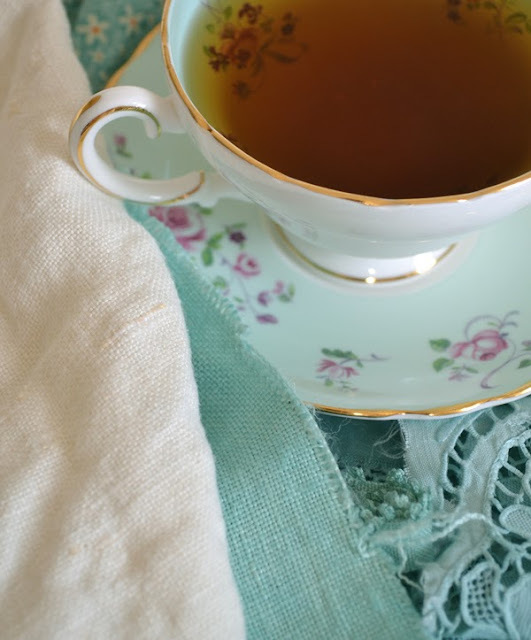 Thank you so much for sharing your Tea Cup Tuesday, sweet friend! 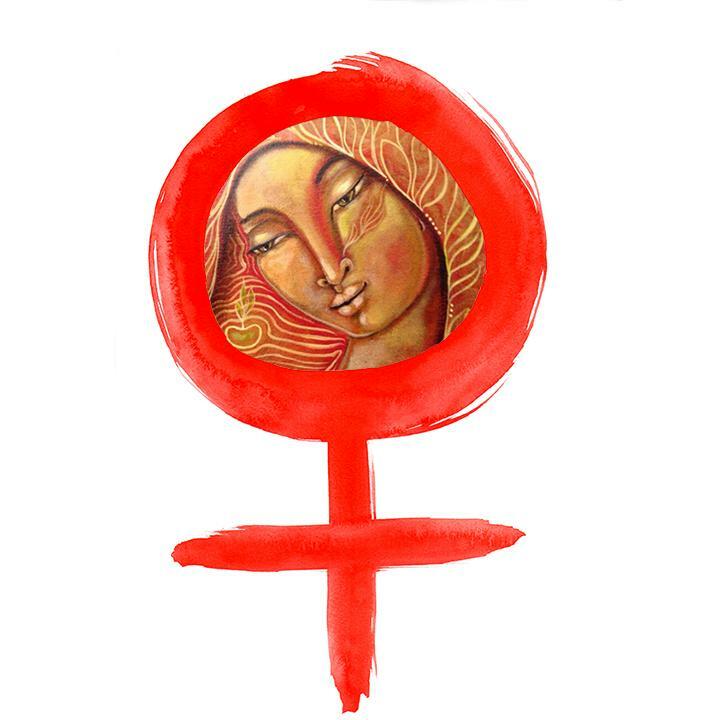 Suziqu is an amazing artist. I'm delighted to say I too have of late been creating some textile collages. The one you have from Susiqu is exquisitely beautiful. Thank you so much for sharing. I love the way you use the Rit to color your linens and laces so perfectly. Yes, that teacup is very sweet. You are always an inspiration! Well I can see you drinking many a cup of herbal tea as you enjoy creating your new collaged banner. Terri it is coming together so beautifully and you should be so proud of your work. The dyed laces and doilies you began with are the softest shades. I love them and, of course, they are your colors too. I've never used the RIT dyes but may give them a go. I often use the silk dyes. It was such a pleasure to create this collage for you and do hope it inspires you to make many more beautiful pieces. Such romantic and gorgeous compositions,...every one! Love the blue ... one of my favorite hues! 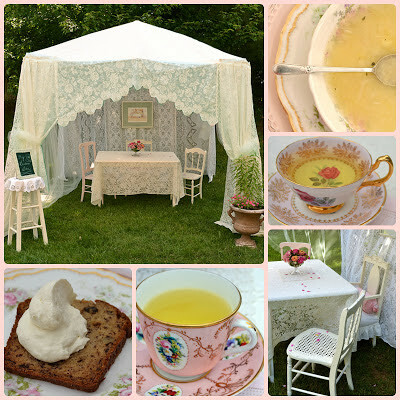 Love your garden tea..... the lace shelter is awesome! 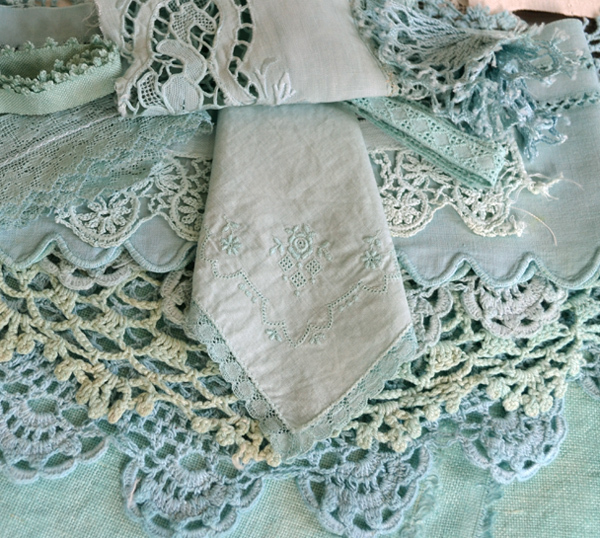 beautiful, beautiful, beautiful aqua-dyed linens and lace!!!! 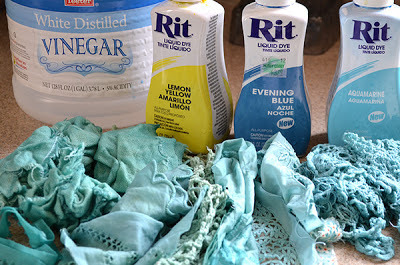 I LOVE IT ALL and now want to run to the store and buy a bunch of Rit dye!! Just scrumptious. Can't wait to see what you create with it! 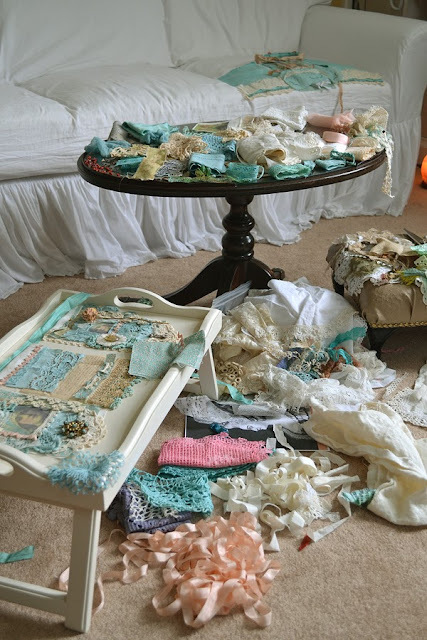 What a beautiful collection of lace you have and I love how you dyed the lace to the beautiful aqua color! I never would of thought of that! I have the same teacup as yours, so pretty! Thank you for hosting your party and have a great holiday tomorrow! Oh Terri, you have the most wonderful blog friends. Such a lovely gift. I enjoyed your blog and your dyed lace. I am a bit timid about such things! I guess I need to just jump in and try some of these fun things. Hope your rain has eased.